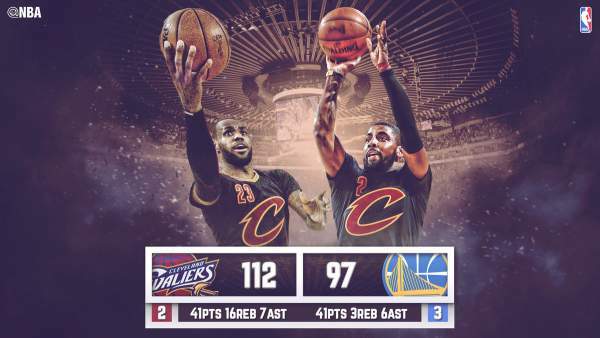 Game 5 Highlights: Cavaliers beat Warriors 112-97 (2016 NBA Finals) - Balita Boss! LeBron James and Kyrie Irving coming up huge for the Cleveland Cavaliers in Game 5 of the 2016 NBA Finals to extend their season at least one more game. James had 41 points, 16 rebounds and seven assists, and Kyrie Irving added 41 points and six assists as the Cavaliers beat the Golden State Warriors 112-97. According to the NBA's official Twitter account, James and Irving became the first pair of teammates to finish with at least 40 points apiece in a Finals game. Klay Thompson scored 37 points and Stephen Curry had 25 for the Warriors, who were without the suspended Draymond Green for the game. Andrew Bogut left the game early in the third quarter with a knee injury. Game 6 is Thursday in Cleveland (Friday in the Philippines).